Lou Severine is an executive with over 20 years of experience in digital media and advertising technology. 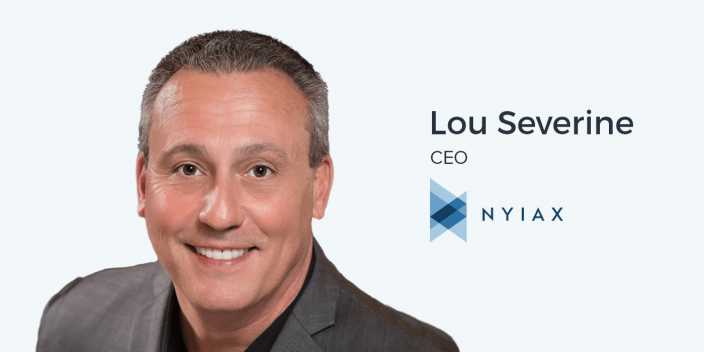 Currently, Lou is serving as CEO of NYIAX, a revolutionary programmatic advertising platform developed in partnership with Nasdaq. NYIAX combines financial trading and advertising technology in one platform to enable publishers and advertisers to buy, sell and re-trade premium advertising inventory as financial inventory. As the first and only trusted, transparent future inventory marketplace, NYIAX allows both publishers and advertisers to increase ROI and reduce costs. Lou has more than 20 years in digital media technology and advertising. He was most recently CRO of Phluid Media, SVP of AOL Networks and Director of BD at Microsoft. While a digital advertising remains a powerful acquisition channel, like most other digital marketing at or point or another, advertising can be susceptible to fraud. This a losing situation for both advertisers and publishers. NYIAX is an organization looking to solve this problem. With more transparency between advertisers and publishers, the likelihood of fraud dramatically increases. An important part of creating this transparency is blockchain technology. This allows for a more accurate system of record keeping and accountability with the usages of digital advertising dollars. Implementing blockchain and smart contracts to the payment and execution of programmatic advertising can help solve the problems with verification and reconciliation, increasing the ROI of ad spend and lowering the cost of customer acquisition. With blockchain technology and the rest of the NYIAX platform, a direct and automated relationship between advertisers and publishers will help prevent fraud and mitigate the amount of wasted advertising dollars. As advertisers and publishers are able to track the results and cost of advertising more accurately, it will create a win-win situation for all stakeholders in the digital advertising space. Ander: So, it was a few months ago now, maybe a little bit less, that my former colleague and good friend Kat Leznik told me that she was working at this new company, NYIAX. And when I looked up this company, I immediately said this company is doing really cool stuff in the advertising space. I have to talk to their CEO for this podcast. And it just so happens they’re based in New York, and that I’m in New York right now with so I’m here with Lou Severine, the CEO of NYIAX. Lou, thank you so much for taking the time to talk to us on this Wednesday. Lou: My pleasure. Love the fact that you think we’re doing some interesting stuff. Ander: It’s fascinating! And I explained a little bit about it in the introduction to this interview, but it’s going to sound much better coming from you. What is NYIAX? Lou: NYIAX is a guaranteed contract matching engine, or advertising exchange. We’re built off of NASDAQ’s financial framework. We have built an advertising trading platform for guaranteed contracts from buyers to sellers in the RFP/RFI process. The IOs right now are done in a manual basis so we’re going to actually automate that for them. Ander: Awesome. Why is this so important? There are some big problems, obviously, in the advertising space. We all want to lower our cost of customer acquisition. What problem is this really solving? Lou: Well, I don’t like to ever think that we’re solving a problem; I like to think of how we can be an added value. Lou: We’re an added value to the buyers in the fact that they’re able to go in and take a look at all of our publishers on our platform and their inventory. And our belief is to go, of course, to the Comp Score 100 but we also want to go to some of the smaller-to medium-sized publishers that have some very valuable inventory that some of these advertisers and agencies might not know exist or have never made relationships with. Or in the programmatic world they never get to see it. Because as you know, in the programmatic world you’re in real-time, you’re in 100 milliseconds, and you’re in there buying and bidding on everything and then your ads are served. So you don’t really know where they go or how they go. It’s kind of bundled out and shipped out across the publisher network. But in our world you can buy in what’s known as a forward contract world, so kind of like the upfront world and this will allow them now to take a look at the inventory of all of the publishers and pick and choose what they want. They can buy exactly as to what the CPM, the publisher, put up. And now the publishers have the advantage because they have their direct sales teams, whatever isn’t sold in the direct world 99.9% of the time goes into the programmatic world. Lou: Well, this is kind of a step between that where now they can take that and in a little less than what they were charging for premium that they didn’t sell, they can put that up there and now these agencies that might not have known about this or might not have bought this can see this inventory and buy it. Ander: So you’re creating a ton more transparency. Lou: Yeah. Thank you for the segue into that. We will be the only transparent automated network or platform or exchange out there. We’re going to be the ones that put the power back into the advertiser’s and the publisher’s hands and kind of take away a lot of the programmatic tax that’s out there today. Ander: Yeah, it sounds like this is a win-win for everybody. Now, before we get into why advertising really needs this and some of the nuances of what you’re working on and why it’s so important, let’s hear a little bit about you. You’ve got this really interesting background. You spent a good amount of time at adMarketplace, some Adknowledge – I love that name, by the way – and also AOL. What’s your professional history? What has your professional journey been like? Lou: I started off in technology in the 90s. Worked actually in paging – that’s kind of how far back I go. Lou: Yes. We kind of certified and invented the way that texting is done today at a company called SkyTel, which was two-way paging, two-way-texting. From there went into broadband, built out the way that cable modem boxes work today with a company called Covad Communications in the DSL world. Then I went into online advertising. Kind of saw that as being a commodity and went to work in email marketing. Great company called Digital Impact that I worked with for quite a few years. It really taught me the way that online advertising and marketing world work. From there went into the display world of it with ad servers. Worked at aQuantive. aQuantive was purchased by Microsoft. Was at Microsoft for a couple of years and then went over to AOL to start up their adtech division of AOL… not start it up, but kind of launch it a little bit more into the United States. This was a Frankfurt based company that they had purchased just recently. Probably the best job I’ve ever had was at AOL. Lou: The colleagues and the friends that I’ve made from that company are amazing. I have five of them that I brought over here to NYIAX with me from AOL: my Chief Revenue Officer, Will Schmahl, worked with me at AOL and Richard Bush, my Chief Technology and Product Officer, along with other ones that are on our team. From there dabbled around as, you know, heading sales companies within the search as well as display, video, mobile frontiers of the early 2010, 11, 12 timeframe. And then this came to me through a friend named Tom O’Neill who I’ve known for almost thirty years. We actually belong to the same country club on Long Island. And he came to me and said, ‘I’d like for you to take a look at this. These guys are asking me to help them raise money as well as bridge a relationship with NASDAQ.’ Tom sat on NASDAQ’s board for twelve years. And I read it and told him it can’t be done and he said, ‘Well, what if we build it on NASDAQ’s platform?’ And I said, ‘Well, that’s a whole different world that you’re talking about. You’re already taking a proven financial trading platform that’s probably the best in the world,’ – 44% of every trade done today in every currency out there across the globe is done on one of NASDAQ’s exchanges. Ander: Wow! I was not aware of that specific number. Lou: 85 exchanges in 52 countries. Lou: From what I was told. It could be more now; it could be less… I don’t know. Lou: They’re opening up exchanges everywhere. And I said I want to be a part of it, so he kind of brought me on as his advisor and I was working with the two co-founders, Carolina Abenante and Mark Grinbaum. And around July time frame when the funding was almost secured, our first round, they asked me to come on as the Chief Executive Officer and build the company. Lou: And that’s where we are today. Ander: Now, what is it about NASDAQ’s platform that made this possible, that actually makes this work? Lou: Because in today’s world to go out and build something that probably has over $100,000,000 and fifteen to twenty years of building it… and to build this type of an exchange in the online advertising, well, by the time you built it, it would be commoditized. It would take years. Lou: And NASDAQ has proven it’s regulated. It’s regulated more than any other exchange out there in the world today. Think of how many different security exchanges across the globe that they have to deal with. And it’s extremely flexible. The way that they’ve done it, the OMEX platform, their financial framework platform, they’ve sold this off to many people that have built a UI via an API into their platform. And their team knows what they’re doing so working with them has been probably the best partner that I’ve ever had in my 25+ years in technology. Ander: Yeah, the partnership you have with them is pretty impressive. I’m wondering how they reacted when they heard about this idea? Lou: Yeah, so Tom is very good friends with Adena Friedman, who is the CEO now. At the time she was, I think, the CFO and President or Chief Operating Officer and President. And he went to her with this idea and she’s kind of a techie… She gets it. She understands it. And she was looking for a way for NASDAQ to move into another industry or another vertical. And a proof of concept. And, what better… and with all the different ideologies and data points that go on in the programmatic AdTech world today, to prove how good NASDAQ’s financial framework is. So we started working them roughly about end of January 2016 on building our platform and we accepted our platform I think mid-June of this year. Lou: So it took just a little over a year and we’re beyond satisfied. And the working relationship we have with them, not just from a product standpoint but from a business standpoint, is phenomenal. From their CMO to their SVP of Strategy to our day-to-day contact Mark Driscoll, they’ve just been an incredible partner. You couldn’t ask for a better partner, so I don’t even feel like we’re a start-up. A kind of a startup on steroids. Ander: You know, it’s funny. I was just about to say I know that I guess technically in the minds of many people you guys might be considered a start-up, but you’re a start-up with this – to use an advertising term – inventory of awesome executives, of incredible partnerships and technology that is going to do really awesome things for you! Lou: Yes and you know, it’s helped a lot having the NASDAQ name behind us because it’s opened up a lot of doors, especially to the tough ones like the holding companies. And the top 50 publishers out there, they’ve kind of contacted us. Lou: And I don’t think if we were just, you know, NYIAX building this platform without NASDAQ behind us, that all would have happened no matter how good we are. Lou: But of course having a name, a behemoth financial giant like NASDAQ behind you made it much, much easier for us so we’re beyond grateful and, you know, our partnership is just growing day by day with them. Ander: Yeah. Now, you said top 50 publishers. What are some examples? I’m sure that we could think of them on our own but some of the ones that just come to mind for you? Lou: Well right now, I’m under NDA with them and we’re doing an alpha and a beta. Ander: Definitely don’t want to violate that! Lou: Don’t want to violate that. Just like I used the word ‘holding companies’ and didn’t mention their names because I can’t really mention anybody because we’re not live. But the minute we’re live, everything is transparent. Our platform is going to be all open so everyone will be able to see everyone. Ander: That’s awesome. Now, just for anybody who might not be as familiar with the programmatic advertising world – just in case, to cover the bases – how would you define it? What would you say separates that from other digital? Lou: It’s a way where they automated how online advertising is done in a real-time world. In the past it was bought and sold via Excel spreadsheets and emails and phone calls. Programmatic came into place with some of these RTBs, DSPs, and SSPs where they made it much more automated and it was really good for the industry. Unfortunately, it has kind of eroded a little bit because of the fact of fraud and no transparency. Lou: I think, you know, there really wasn’t much fraud, there really wasn’t much non-human traffic. It was going out there and gobbling up ads and there wasn’t many bots that were disguising themselves as websites. But in the programmable world and done in real-time, it’s much easier and there’s no direct relationship. So last year in the United States 22.5% of every dollar spent was fraud. Lou: On advertising, on online advertising. So that came out to roughly about 8.5 billion dollars. Ander: That is completely unreal. Lou: Yeah. So we’re hoping – and we know… we’re not hoping, we know that we’re going to decrease fraud because of the transparency and the ability to have a direct relationship in an automated way where they know they’re going to be buying from, say, Wall Street Journal, or Forbes, or Financial Times because they can see it within our platform. They know where that contract is going because that contract is guaranteed by the inventory that those publishers are putting up. Where in the programmable world, you’re bidding in real-time according to demos and geographics, and it just goes across to maybe 50, 60 different publishers and some of them might not be the actual publisher you think they are. Now, are we ever going to stop non-human traffic? I don’t think so but to kind of cut 22.5% in half or less is a win. Ander: That is a win. And I imagine that this is going to also result in increased click-through rates? Increased conversion rates? Lou: We hope, yeah. That’s the goal. I mean, we’re not going to know until we launch. Lou: Our testing has been extremely favorable so far. Ander: And what’s also really cool about that with the median conversion rate… AdWords, just as an example, has a median conversion rate is around 2.35% or and that goes across all kinds of digital advertising. I can’t think of another business case where it’s ok to be wasting 95% of the dollars you’re spending on something. Lou: There’s not. And if we can cut that by, you know, let’s say 15%, think of how much more of an ROI that the brands are going to have. Lou: And the publishers are going to be able to see, ‘Well, now I know that I can sell Colgate on my site because I know that Colgate’s buying on my site because I have that direct automated relationship with them. I’m guaranteeing those contracts. I’ve uploaded my sales packages, or my inventory,’ which is basically the people that visit their sites and where it is and what it is, ‘and I can actually say that, oh yeah, now actually Colgate is selling on there.’ Or Mercedes or Ford or on and on and on… Once we start to get more data and have more transactions, we’ll be able to provide a lot more, I guess, statistical information back to the advertisers and the publishers as to what’s working and what’s not. Ander: So publishers will actually be able to use this historical data to basically price the contracts in a more favorable way to them? Lou: Because of the transparency that they’re seeing and they know who’s buying on their site, they’re able to then know what to package, how to package it, because of what happened. What was the CPA on this campaign? Or what was the click-through over here? Or how many did they sell? Or how many people actually went to a post-click landing page or went to a shopping cart? They’ll be able to know that data so it’s going to be a lot easier for them over a period of time. We have to walk before we get there. Ander: So with how programmatic advertising is right now, obviously NYIAX is going to be providing a really fantastic solution for a lot of the problems, but what is something that you think people in that space are doing wrong right now? Lou: Well, let me clarify a couple of things. I really wouldn’t consider us a programmatic solution. You can utilize our system to do that. So it’s not a programmatic world because programmatic is real-time, it’s done in a hundred milliseconds and basically it’s right there, you buy instantaneously. Ours is more of an automated way to buy and sell contracts for advertising. And I think that’s where we’re going to be different and I think that’s kind of where we differentiate not only ourselves from programmatic but to transparency. Lou: So programmatic, I think, has gotten into it because there’s too many players, there’s way too people that are touch points. A publisher today puts up a $5 CPM. If they get back $2, they’re lucky. With all the people that touch, all the programmatic tax that touches along the way. Advertisers basically aren’t getting an ROI because they don’t really know where their ads are going. There’s been a lot of advertisers that have stopped and their ads are still being run because there’s no transparency. Nobody can see where it’s going or where it’s coming from and that’s where the fraud has come into play. And the only way to stop fraud is to open it up. Open it up and everybody be able to play on a level, fair playing field where everybody knows who everybody is and you take away the black box because the black box allows the bots to come in and that’s where the fraud happens. I think transparency and fraud are the two biggest downfalls of programmatic today. And I don’t remember who exactly it was that came out – I just read it recently – for the first time ever, programmatic advertising was down 12% in the first quarter. Lou: It was either ComScore or eMarketer or one of those. But the advertisers are getting smarter. They don’t want their dollars to be wasted and they’re putting the pressure on the holding companies and the holding companies now are putting the pressure on the programmatic world where they’re saying, ‘Give us a better solution.’ So we feel we’re in a very, very good spot to come in with that better solution. Ander: Gotcha. Now obviously, throughout the course of your career, you’ve developed an expertise in all of this stuff and you came into this role because you have that expertise [chuckles]. What is something, since you’ve come into the role of CEO here at NYIAX, what is something that you’ve learned that surprised you? Maybe something you weren’t previously aware of or something that was a reality check of some kind? Lou: Great question! I don’t think I’ve really thought about that one. I would say just running a startup. Ander: Mm-hmm. Is this your first startup? Lou: Running it, yes. No, not my first start-up working for. Lou: I’ve run sales organizations, I’ve run support organizations, I’ve run sales and support organizations in start-ups. Never being the CEO. You know, it’s Murphy’s Law – everything that can go wrong, will go wrong – so there’s been some bumps in the road. I think the biggest challenge that you always have in any start-up is people and finding the right people, trying to teach them the way that we’re trying to go to business. And we’ve found great people so I think we’ve been extremely lucky there. But I would say just the people and getting it ramped up has been probably the hardest part. Ander: And what about your knowledge of the industry? Have any of your perspectives changed at all since starting this? Ander: I like the confidence! Haha. Lou: It’s been very eye opening. I think the only thing that I’m a little bit shocked about is the level of interest that we’ve gotten. Lou: I didn’t think it would be this much. And when we put out our press release on March 14th about our partnership with NASDAQ and the fact that we were launching into our pilot, over fifty publications picked it up and we did an embargo. Because nobody would do it exclusive when we tried to get them to. And we did an embargo and our PR company, Blast PR and Alana McGillivray, who’s amazing, best PR company I’ve ever worked with in the past, in my entire career said, ‘If you get about fifteen, twenty pickups that’s pretty good.’ So over a period of time we have over fifty and all the different interviews that we’ve done from the people that actually said that they didn’t want to do it as an exclusive has been amazing. And again, I attribute that to being a partner with NASDAQ. Lou: So that’s been my biggest shock. Ander: And another thing that’s interesting is there’s no other company doing this. Lou: No. Well, there’s a couple that do certain bits and pieces of it. Lou: But I don’t think anybody has the full solution that we have off of NASDAQ’s financial framework. We’re not even going to light up all the capabilities in our 1.0 that NASDAQ has because we have to walk before we run. But our 1.1s, 1.2s, and 1.3s… we’ll load a lot more capabilities into our platform. Lou, we talked briefly, before we hit the record button for this interview, about blockchain. I actually did an interview a few weeks ago with a guy who is in the Bitcoin space, which obviously is a totally different universe. A little unpredictable to say the least. Lou: Yeah, it’s a similar philosophy but in a different way. Ander: Yes. Needless to say though, blockchain technology is something that is growing very quickly. It’s something that’s becoming very, very relevant, especially in the financial industry and the advertising industry as well. So how does that play into what you guys are doing? Lou: Well, it’s great. We’re going to be utilizing a blockchain technology from NASDAQ and we’ll be the first platform on NASDAQ’s financial framework that is in the Cloud and we will be the first exchange that uses blockchain for them. So we’re doing a ton of different proof of concepts in that part. You know, blockchain is an immutable core ledger that records every single transaction from beginning to end in infinity. And we find that that’s going to be invaluable to this industry because it’s never been done before. Verification and reconciliation in the programmatic world now also has been another huge problem or issue. You know, someone has this count, someone has that count. And it’s millions and millions of dollars by the time you get done with it as to who wins or what. Publishers, nine out of ten times, lose. We feel, by utilizing their verification systems as well as blockchain, we’re going to alleviate a lot of those problems also. Ander: Awesome. Now, if we step back from advertising, if we step back even from digital, if we just look at marketing as a whole, where do you think marketing is headed in the future? What do you think is going to change and how can we as advertisers, how can we as marketers, really prepare for what’s coming? Lou: I feel that everything has to become transparent. I feel that every single advertiser and agency needs to know exactly where every single ad is going and in an automated way. You can’t do it in a direct way today. There are too many publishers out there, there are too many relationships you have to build, there’s too much inventory. So if you can help streamline that and automate it but keep it transparent and keep it where they actually have value of every single dollar they spend, that’s where marketing is going. Because it can’t keep going the way it’s going today because unfortunately, the fraudsters are pretty smart. And every time we come up with a solution as an industry, they figure it out. And they’re only going to get better at it because that’s all they focus on. Lou: And the only way to stop it is transparency and to be able to have a direct automated relationship. And I think real-time will always be there to a certain point, part of the inventory or the spend that’s out there, but I think if we can have the direct relationships as well as an automated direct relationship, I think it will alleviate a lot of the waste that’s happening in today’s online advertising spend. Ander: Awesome. Well, I certainly look forward to all of those things happening. You guys are working on something very cool as I have said many, many times. Thanks so much for taking the time to sit down, inviting me up to your office here in the… I guess we’re in Chelsea, right? Ander: Yeah. I sort of know my New York City neighborhoods but I’m getting better every time I come. Lou: Every time you turn a corner there’s another New York neighborhood, so don’t worry about it! Ander: Right! When I used to come here more often for work, I used to get very happy when I did not use my phone to figure out which train to take. Lou: Think of it as a grid. Lou: The streets go east to west, and the avenues go north to south. Except for Wall Street. Other than that you can figure just about anything out. Ander: Yeah. So, Lou, if people want to check out what you’re doing, they want to get some more information, what’s the best way for them to do that? Lou: They can email us at info@nyiax.xom or go to our website, nyiax.com. We’re going to be at a couple of Digiday events coming up. I’ll be speaking at DMEXCO as well as the Web Summit in Lisbon. Other than that, go on our website and ask us any question. We’re more than happy to answer. Ander: Awesome. Lou, once again, thanks so much for your time. Lou: Thank you so much. Appreciate it.